In addition to its three headlights, the Taz also features amber side LEDs for improved off-axis visibility. Light and Motion's Urban lights (a favorite of mine) have side lighting provided by an amber lens over a cut-out that goes to the primary LED. On the Taz, the side lights are actually a separate LED, and can be switched on and off with a separate button. The side LEDs can be configured to slowly pulse, or to follow the primary light's mode by being in steady burn or rapid-flashing. 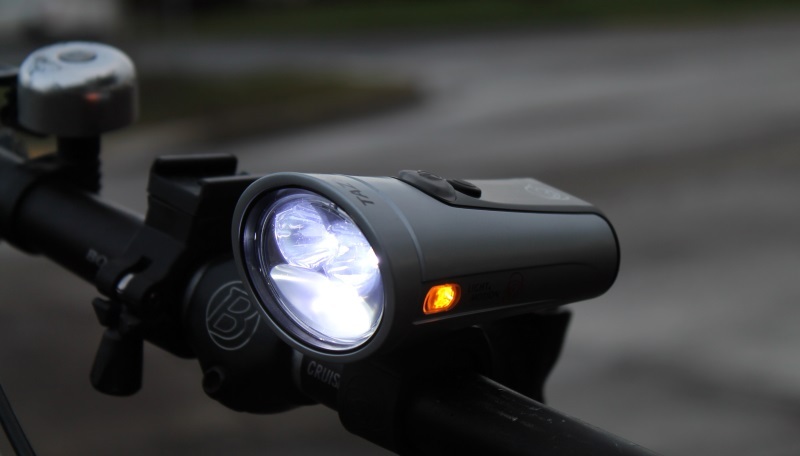 This feature makes the Taz a great light for people who both commute and bike off-road, as the side lights can be disabled when there's no traffic around, momentarily switched on to illuminate bar-mounted cycle computers, or put into pulsing mode when cars are nearby. You can choose between high (1000 lm), medium (500), low (200), strobing, and pulsing modes on the Taz 1000. Even on the lowest setting, it's plenty for the average commute on decently-lit streets, but at full brightness it rivals car headlights. This light is more than adequate for mountain biking at night, and borders on overkill for commuters. The Taz series also offers what L&M calls "race mode", which lets you switch between 800 and 350 lumen brightness with a single button click. 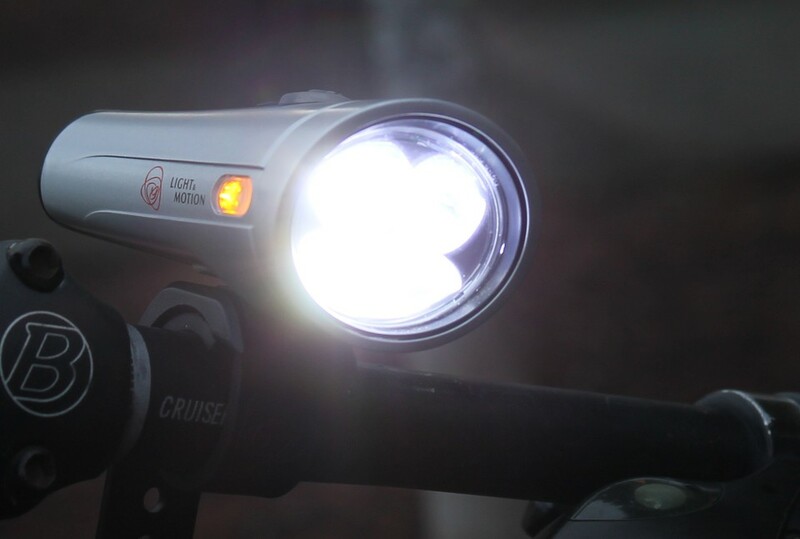 This is handy for off-road riding when you want to quickly toggle between bright light for descents and less light for climbs, and is also nice for commuting if most of the roads you're on are well-lit but you hit the occasional dark area. The Taz follows Light and Motion's trend of using built-in rubber straps to mount the light. Being a bit heavier than the Urban series, the Taz's mount is thicker and a bit harder to get on and off in a jiffy. The inch-wide rubber strap wraps around the handlebars, then must be threaded through the mount and secured through a plastic nub. With a couple days of practice, I was able to get the light off in a few seconds, but it's definitely a hassle compared to the easy on-off for lights that slide into a plastic mount. On the other hand, the light is extremely sturdy when mounted, and there's no risk of it sliding out of its mount. 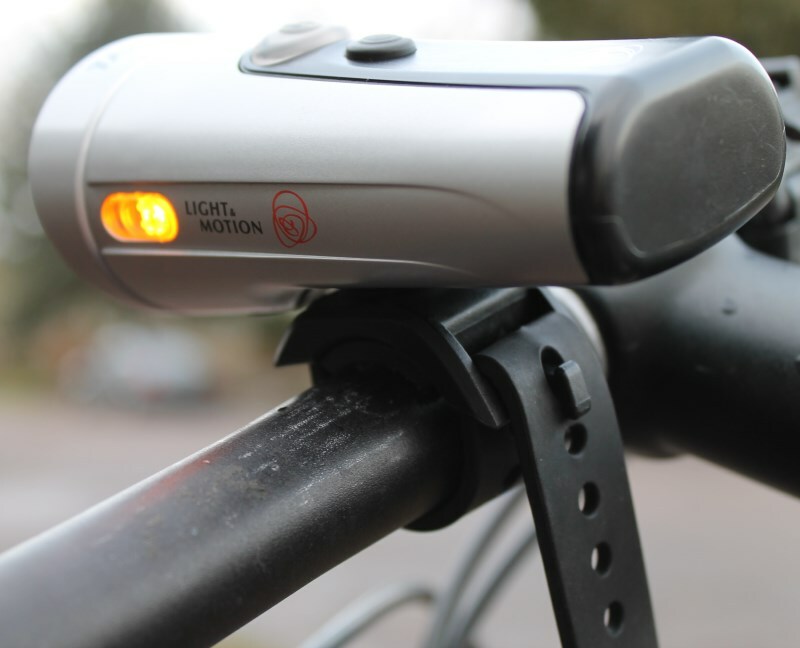 Additionally, it's easy to move to another bike because the mount goes with the light. Despite being a bit unconventional, the mounting mechanism has grown on me. While many lighting systems with external battery packs rival the Taz's output and beam shape, nothing comes close to the balance of brightness, optics, battery life, and weight that the Taz offers. At $300 retail, it's more expensive than almost any other single-piece light, but it's well worth the price if you're looking for high-end features in a relatively small package.